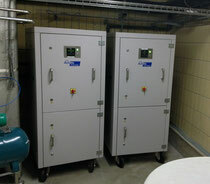 Large companies in the food industry are convinced of the efficiency and reliability of the AWG 1000. Even the largest enterprises can cover a wide range of applications with ActiWa® at the same time using only one generator. The enormous daily output of more than 20 m³ ActiWa® leaves nothing to be desired. With this amount of ActiWa®, an incredible 15-30 million liters of drinking water can be disinfected per day.